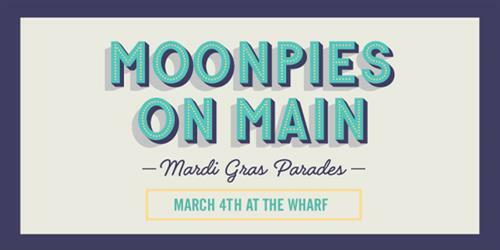 Get ready for MoonPies on Main! It’s time for our annual Mardi Gras parades at The Wharf. Pile on as much purple, gold, and green as you can stand! The Kid and Pet Parade kicks off at 4pm in front of the Ferris Wheel. Get your krewe down here early and dance to live DJ entertainment. There will be loads of activities for the little ones as well, including a rock climbing wall, face painting, bouncy house, and various live animals. The fun will continue after the first parade, so stick around for the nighttime float parade at 6pm. This is the perfect chance to fill up that remaining empty space in your goodie bags with more beads and candy galore! Catch the SPECTRA Sound & Light Spectacular show directly after the parade.